More than 25 new features including Offline Setup, new Effects and Output Matrix Processing. 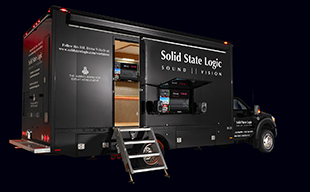 FRANKFURT, GERMANY — Solid State Logic, the world’s leading manufacturer of tools for creative audio professionals is proud to announce the imminent release of new V2 software for the SSL Live console at the 2014 ProLight & Sound Show (Hall 8. Stand L80). The SSL Live, the company’s first ever dedicated live sound console, has been extremely well received by the live sound production community since its announcement at last year’s Frankfurt show. Positive response has continued to grow as users report that sonic quality is inspiring, the creative user experience is excellent and reliability and stability is well beyond expectation. The release of new V2 software for the console introduces a substantial collection of significant new features. The release coming a mere six months after the first units rolled off the production line demonstrates the rapid pace of ongoing development at SSL and proves the company’s well founded reputation for listening to customer feedback and developing new and exciting functionality that moves beyond industry expectations. Within the Version 2 software release there are more than 25 new feature additions to the SSL Live console, covering enhancements to the Output Matrix, Effects Rack, User Interface, Routing, Solo System and Focus Channel… and the introduction of a comprehensive Offline Setup application. The new software is due for public release in April 2014, will become standard on all new consoles and available for free to all existing owners. The SSL Live PC Offline Software allows engineers to create, setup and edit all aspects of a Live Showfile from the comfort of their own laptop, making creation or editing of Show and Preset files simple and efficient. The user is presented with the same menus, screens and options as the full console software creating a familiar user environment, enabling them to configure a Showfile from scratch or load one of the SSL Template files and edit it to their own requirements. All aspects of the Console Configuration can be edited, giving the user full control over the power of the Live’s Tempest processing engine. Full access to stage box setup and routing is provided. Along with naming, colouring and the unique Eyeconix channel identification tools. The layout of Fader Tile layers and banks can also be configured and accessed from the software. As well as control over mix bus routing, pre/post feed point sourcing and all other audio related channel parameters. In addition the Automation system is fully accessible so that scenes, automation filters and input/output actions can be created, edited and updated. This also includes Group modes, scene re-numbering etc. Once a Show file has been created or edited it can be saved and exported to a USB key and then imported into the Live console ready for use. The Version 2 release brings a selection of new effects that introduce additional sonic options and ways to maximise the processing power of the Tempest platform. New effects include: four EQ types (the super flexible G-Flex EQ; which comes in 8, 16, 24 & 32 filter versions, a new, smooth Contour EQ, 1 & 2 band Dynamic EQ and a 4+2 Band Parametric), four new Delay effects (Tape Echo, Ping Pong, a new Short Delay and new Multi-Tap delays), ‘Guitar Cabinet’ and ‘Bass Cabinet’ emulations and five Reverbs (Ambient, Cathedral, Stadium, Recording Room and Tight ER). These new reverbs increase usability and makes reverb set up much easier whilst retaining the supreme audio quality of the ER Verb from Version 1 Live software. A new Phase Scope Tool has also been added - With All-Pass Filters available on all processed paths the addition of a Phase Scope to the Effects Rack allows the operator to use them more effectively and speed up their setup. Version 2 also includes a number of enhancements to the SSL Effects Rack itself to streamline effect browsing, naming and routing. Matrix Outputs now have EQ, All-pass filters and delay processing available. All 36 Matrix Output paths now have High and Low Pass Filters, 4 band parametric equaliser, 2 seconds of delay and our unique All Pass Filters available. This is in addition to the two inserts that can be used with both the internal Effects Rack and external processing. As with all the other path types within the Tempest engine, the processing order can also be changed by the operator to customize the signal flow for their requirements on a Matrix by Matrix basis. A ‘Swap Button’ has been enabled on the consoles Fader Tiles and allows the user to assign any bank of a Fader Tile to the Swap button. Once assigned the operator uses the Swap function like a ‘Home’ button, letting them jump back to their preferred Fader Bank at any time with one button press. As with the consoles Flip Function, Swap can be used independently per tile or globally if Swap is pressed and held down. With up to 75 banks of faders available this function adds flexibility and speeds up access no matter how many banks the user has available. A new ‘Focus Channel Lock’ function allows the user to assign a path permanently to the Focus Fader and the Channel Control Tile. Perfect for that important channel that you always need to have control of.